How can parents and families help vegetables be healthy and fun? 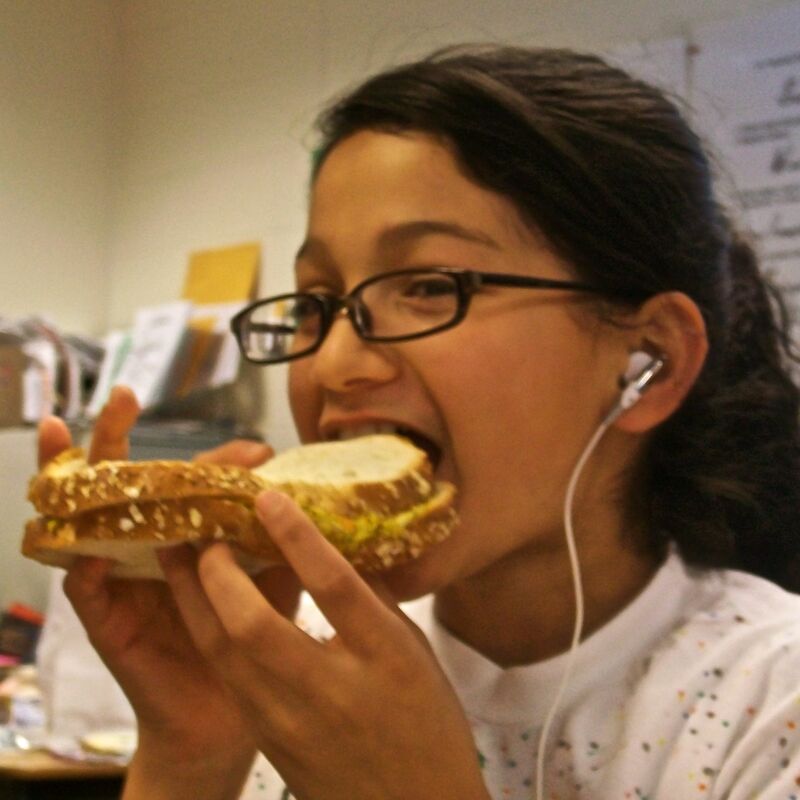 Here is a written transcript of a call-in show, for ideas from Denver Public Schools Superfoods Director Anne Wilson, and from KGNU fans who include 2nd grader Cassidy, Oakleigh Thorne from Thorne Ecological Institute and many more. Show hosted by Shelley Schlender. This call-in show was part of our on-going series about The Broccoli Campaign. [child singing] Da-da, broccoli is so nasty! Voice: Do you like broccoli? Child: I hate broccoli. Child: Yeah, I do like vegetables. Voice: Do you like broccoli? Child: Yeah! Child: During this Thursday morning, for our call-in show about eating vegetables, we ll talk with kids, we ll talk with experts on nutrition. That s the call-in show, this Thursday morning at 8:35. [child singing] Let s try some vegetables, let s try broccoli! Schlender: Well, good morning to you. I m Shelley Schlender. With me in the studio is Anne Wilson of Denver Superfoods. Good morning, Anne. Schlender: And as you just heard, this is a call-in show about vegetables, how to see if we can make eating vegetables tasty and fun. Anne, can you tell a bit about how Superfoods for Denver public school ties in with that? Schlender: Lots of ways to encourage kids to eat vegetables in the schools. For those of you who have been listening in during the mornings this week, you ve heard some of the struggles that children can have, their love-hate relationship with vegetables, as you ve heard Cynthia and Nancy talking about how to promote broccoli when Cynthia hates broccoli. She actually seems to have a taste bud that doesn t like it. If you want to check in on some of those stories, you can go to our website, EatYourRadio.kgnu.org, and you can check those stories and you can also take a broccoli survey yourself to see how you rate and what you think, and you can share your opinions on what you suppose is the best way to promote vegetables and what you think of broccoli. Those are all possibilities. And also, you can call us here at 303-442-4242 and share with us your experiences with vegetables, helping yourself eat more of them, or why you don t want to eat more of them, helping children in the same way. Let s start with you, though, Anne Wilson of Superfoods. Why do you think that vegetables really do help kids? Wilson: Well, there s a lot of reasons that adults as well as children should eat fruits and vegetables. They re a great source of vitamins, minerals, and antioxidants. They ve done studies on people that eat more fruits and vegetables have a lower risk of chronic diseases such as heart disease, stroke, and hypertension. High consumption of fruits and vegetables also can be beneficial for weight management, because fruits and vegetables have a low energy density. If you eat them as part of your diet, you will consume more calories and less fat, presumably, over the day. Schlender: So you ll consume a better range of calories, meaning that you ll have more minerals and fiber and all of those things, and you might feel good enough that you don t reach for as much junk? Wilson: Exactly. Exactly. And that s the hope with really promoting it to the students. And we know that a lot of kids aren t eating enough fruits and vegetables. Based on what data you look at, only a third of adults actually meet the recommendations for fruits and vegetables, and it looks like in kids that percentage is lower. So it s very, very important to promote fruit and vegetable eating. Anne, I m going to imagine a plate right now for a day. How many fruits and vegetables should I eat, and does that piece of lettuce on a fast food burger count? Wilson: Well, there s a couple of ways to look at it. The recommendations through my pyramid for kids say that they should eat anywhere from one and a half cups to three cups of vegetables a day, based on their age and activity level. If you look at a dinner plate, half of your plate really should be filled with vegetables if you re trying to achieve that goal for a day. So it s really, really important when you re educating kids to show them what the target is. And a lot of research has looked at, too, to get kids to each more fruits and vegetables, to really start the meals with, like, a salad or some kind of first course that s vegetables, and they will consume more vegetables in that meal and in that day without consuming more calories. Schlender: You just said half of a person s plate ideally should be vegetables. Do French fries count? Wilson: Technically, in the USDA food pyramid, French fries do count, but for kids, when they do the studies, it looks like about half of the vegetables kids already consume are French fries, so encouraging other fruits and vegetables that are lower in fat, obviously lower in calories than a French fried product is good. And the more variety kids get in fruits and vegetables, the more vitamins and minerals they re going to get, the more colors. Schlender: So lots of colors helps? Because that means lots of different antioxidants and vitamins and minerals? Schlender: But I can’t help myself. I’ve got to go back to that point about the USDA counts French fries as a vegetable. And one of those vegetables to encourage, because it s a vegetable. Listeners, for those of you who are listening to the show, if you want to call in and express your opinion about the USDA counting potatoes and French fries as a vegetable, please let us know by calling 303-442-4242. Call us and let us know what you think about the United States Department of Agriculture, that sets our food policies in schools, calling French fries a vegetable. We d like to hear your opinions on that, among other things. And one of the things we d like to know, Anne, from your perspective, is that really the vegetable for us to even though that s the one that most people eat, is that the one to focus on for health? Wilson: No, no. With the new pyramid and the new dietary guidelines, they really want they have targets for deep orange and yellow vegetables as well as leafy green or deep green vegetables as well, things like broccoli, like leafy green spinach, watercress, romaine lettuce, some of those darker greens they really do encourage, as well as the orange, the deep orange, like sweet potatoes, like squash, like pumpkin, that people aren t getting enough of, and these have really been shown, because of their nutrient content, to help with heart disease prevention and cancer prevention. So they have targets for those now, not just potatoes. Schlender: So those colors are more than just colors. They re pretty, they make it more fun to eat those foods, but they also represents how, when the sunshine comes down and hits that piece of plant, it s created a protective way to keep itself from being pulverized by the sun, and that is antioxidants and other minerals and nutrients that can protect us as well. Wilson: Right. Those colors do represent the different colorings represent the antioxidants. Like red fruits and vegetables tend to be high in lycopene, so tomatoes watermelon, pink grapefruit, great sources of lycopenes. Orange items are high in beta carotene, carrots, mangos, pumpkin, cantaloupe, things like that, very good source. So yes, the more colors you get, the more vitamins and minerals, the more benefits you re going to find, and not just potatoes. Schlender: Well, it almost sounds like if you want a lot of good nutrition, you should just peel all these things and eat the skin. Wilson: Right, although some things, the skin isn t edible unless you cook it, obviously. But it s very, very important to get a wide variety of colors in fruits and vegetables. The flesh also can contain a lot of that. Think about cantaloupe. High in beta carotene, not obviously in the rind, but inside, that inner part also has a good source of eta carotene. That s where you get it from. Schlender: It also sounds like if you eat the dark green leafy vegetables, the kales, the collard green, the romaine lettuce instead of iceberg lettuce, the spinach, the mixed greens, those are better than the light greens, is that true? Schlender: That does surprise me. I m wondering how many parents have children who say, Please give me lots of dark green leafy vegetables. Wilson: And that s the other piece to it, too. The kids, we want to kids to ask, and that s where we re training them in school to ask for that at home, but if it s not available at home, it s difficult for them to eat it. We definitely try to make it available at school, increase their preference at school, but we really want to encourage parents to have that stuff available at home, it s difficult for from to eat it. Schlender: Now, Anne Wilson of Denver public schools Superfoods, we are hearing a lot and we re talking a lot about the healthiness of these foods. Is healthy the way to sell these foods to kids? Schlender: You have special vegetable celebration days throughout the school year at certain schools in Denver public schools. You promote those in the schools ahead of time, and you say, For lunch this day, we re going to celebrate broccoli, or cabbage or black beans. Schlender: Are these all foods that you would call Superfoods? Wilson: These are all Superfoods, they re very nutrient-dense. When we started this project, we had partnered with Dr. Stephen Pratt, who wrote the Superfoods prescription book. It was just a very interesting way of looking at foods and promoting nutrient density. And the foods that we ve targeted this school year in Denver public schools, we tried to pick on not just Superfoods, but focused in on those foods that maybe are very nutrient-dense but kids don t consume a lot of or don t think about a lot, like broccoli, like cabbage. And just to hear at Maxwell, for example, when the kids helped with promoting it, that was their favorite day, Broccoli Day, who would have thought? One of the highlights of their school year was featuring broccoli in the cafeteria. It s just looking outside the box on innovative ways, new recipes, trying new things with kids, exposing them to broccoli in different ways. A broccoli smoothie, I think, when Cynthia said she liked that, it just made my day, knowing that a student that typically wouldn t eat broccoli, hated it maybe in some respects, really enjoyed trying it and she was open to trying it. Wilson: Actually, we focused on a traditional smoothie recipe. It had berries. A lot of our kids like mangos, so we added mangos. It had strawberries. We used a little bit of honey to sweeten it to kind of counteract the bitter broccoli flavor, and the fruit helped a lot with that so we didn t have to use quite as much. We used 100% orange juice and low-fat skim milk and then blended it together, and the kids really, really enjoyed it. I did have some suggestions, though, when we made it, to add some spice, like ginger might counteract the effect. I haven t tried that yet, but it was so popular the way it was that it was a great, great day. Schlender: So the students at Maxwell Elementary really liked that broccoli smoothie, not just Cynthia? Wilson: Right. The students overall loved the broccoli smoothie, so much so that we I actually held a smoothie party for the fifth graders that helped us with the broccoli survey, and they were ecstatic. It was kind of the culmination of the end of the year. They were getting ready for continuation, so they really enjoyed having that opportunity again. Schlender: Anne Wilson, I m curious. In that smoothie, with all these other great ingredients, did you just add one little floret of broccoli, or was there a fair amount of broccoli in the smoothie. Wilson: There was a good amount of broccoli. I think in eight servings we had between a cup and a cup and a half of broccoli, and we ll definitely post that recipe after this. It was very, very popular. It s a great way to expose kids to maybe something that they wouldn t normally try in raw format or even in cooked format. It was kind of a different way to look at broccoli. Schlender: Anne Wilson will be posting that recipe to the Eat Your Radio website. That website is EatYourRadio.KNGU.org, which is also where you can go to take a broccoli survey, and if you want to listen in to stories about how kids themselves are looking at food and vegetables, it s a great resource to go to. We too are funded by the Colorado Health Foundation on doing that project to see about how to get children interested in healthy food and get their responses and their reactions to what healthy food means and what makes them like it, what makes it hard to eat. We can hear from you to hear your responses on these things, too, if you want to call us here at 303-442-4242. Now, Anne Wilson, when you talk about these days where you help children celebrate a special Superfood, one that s high in nutrients, antioxidants, minerals, and so forth, does this mean when you make the students eat this food? When they come to lunch, do you say, You have to eat all of this broccoli today? You have to eat it? Schlender: That s somewhat different than a lot of parents do at home, which is, You have to eat your vegetables before you can have your dessert. Or You have to eat your vegetables before you go out and play. Is that an appropriate way to encourage children to eat their healthy foods? Are there some different levels where it s OK but then it gets to be not OK? Wilson: Well, you know, probably the best thing to do with that, and if you look at the research again, is to just continue to expose children to these foods that they may not like. The research with Leann Birch was up to 12 exposures before a child would accept a new food, and I just read a study and they said that most parents will give it two and a half exposures before they decide a child doesn t like something. So it s important to keep introducing that item to really help shift that preference. Schlender: OK. If I want to introduce children to watercress, if I serve it to them once on a plate and they say, Oooh, what is that? And I said, It s watercress, do you want to try some, and they take a little bit and say, I can t eat any more, if I do that two different times and then give up, then I didn t how many times do I need to do it Wilson: Well, they recommend doing up to 12 or 15 is really what the research I ve seen, and so it s important to keep trying to introduce that, because again, if you only try a few times, you may not get that acceptance. It could take up to 12 to 15 to get the acceptance. Schlender: Is it best to do it with the same recipe each time, or to play around with it and try it different ways? Is it best to say, You have to eat it today. You have to just try it and eat it ? Or is it best to say, You know, maybe you want to take a little nibble ? Wilson: The nibble approach is probably the best. Put it in front of the child, say, This is watercress, you re welcome to try it. You can have as much as you d like, and leave it up to the child. Let them determine whether they re going to eat it and how much they re going to eat. As a parent, your job is to keep introducing it. As far as the form to give it to them, little kids tend to like it isolated, like a single item. They don t generally like it mixed. In school-aged kids, we ve found that they re OK with mixtures, with trying it in different ways. They want to explore new ways of doing it. They want to try broccoli in a smoothie. It s exciting. It s fun. So I d say for younger kids, probably in isolation is the best, but an older kid, definitely try it cooked, try it raw, try it in a smoothie, try it however you think your child would enjoy it being prepared. 0:19:26.8 When we did broccoli at the school, we had a whole-grain, low-fat mac and cheese. We incorporated broccoli in that. We incorporated broccoli in spaghetti. Just some things, nontraditional, but may kids would be able to try it in a food they already like and maybe shift that preference. Schlender: Let s hear some more about that macaroni and cheese that you made with whole-grain noodles. It has cheese, and that s popular with the children. Did you take huge chunks of broccoli, or just little bitty snippets like parsley? Wilson: Actually, we did do the little tiny snippets. We did a survey, and the broccoli survey that actually Cynthia and Nancy had a great hand in, it looked like a lot of kids liked broccoli incorporated into things, but as far as big versus small pieces, a lot of the kids did like small pieces, so it was great to have that information so going forward, when we did incorporate it into the recipes, we could make it the size that they were more excited to try, versus huge pieces that were daunting and they could just pick off. Schlender: OK, so it was little sprinkles of it that helped them? Wilson: Yes, it was finely chopped. Schlender: And Nancy and Cynthia, who are fifth graders, who were fifth graders when this happened, all of them wanted to help make this possible, and they gave you ideas. So the children themselves can give you ideas? Schlender: It sounds almost like it s less peer pressure and more peer encouragement. Wilson: Exactly, that s a better way to put it. Schlender: Peer encouragement. When the child see that a parent really likes a vegetable or that their friends do, they get more brave about trying it. Wilson: Yeah. I ll be honest, with radishes, as a kid, I was not a big radish fan, but I saw my mom eating it, and she just loved them, and I would continue to eat them and continue to expose myself to them, trying to figure out what she liked them. And now as an adult, I love radishes. But sometimes just having a parent, and I think of my mom, that eats all vegetables and thinks they re all great really makes you more apt to try things, more apt to eat them yourself. Schlender: You re listening to a call-in show about eating vegetables with Anne Wilson of Denver Superfoods. I m Shelley Schlender. This is KGNU Boulder/Denver, 88.5 FM, 1390 AM. It s just about 9 o clock. You can join the conversation by calling us here at 303-442-4242. And now with us on the line is Cassidy of builder. Cassidy, welcome. Cassidy [child]: Thank you very much. I was just wondering, is Cynthia still eating broccoli right now? And will you be coming to my school? Because I don t see any kids at my school ever eating broccoli. Schlender: Well, what do you know? What is your school, Cassidy? Which school are you at? Cassidy: Heatherwood Elementary. Schlender: Heatherwood Elementary. And you d like to see more kids eating broccoli? Cassidy: Mm-hmm. Schlender: How about you? Do you like to eat vegetables? Cassidy: Well, I was raised on broccoli. Schlender: You were? How does it taste to you? What do you think of it? Cassidy: I rather like it right now. Schlender: Maybe it s because you ve always eaten a lot of vegetables. Does your family like vegetables, too? Cassidy: Mm-hmm. My dad loves it, and my mom does. Schlender: Your mom and dad do. Do they help you feel good about eating vegetables? Cassidy: Yeah, pretty much. Schlender: OK. What kind of advice would you offer to parents and children to encourage them to eat more vegetables, too? Cassidy: Well, maybe that I sometimes put salt on mine. Schlender: You like to put a little salt on your vegetables? Cassidy: Or I put something with it. Schlender: A lot of the students at Maxwell Elementary like to eat their broccoli with ranch dressing. Cassidy: Yeah, it s pretty good. I like that. It s good dressing. Schlender: Those are good ideas. What other ideas do you have? Cassidy: Well, I was thinking just to if there were students who were my age, nine or over, they should probably just start eating it for, like, a living. Schlender: They should start eating it for a living? Cassidy: Mm-hmm, that s a good idea. Schlender: You think it s so healthy that you want to make sure it s there because it tastes good and it helps you be feeling good? Cassidy: Yeah. Schlender: What grade are you in, Cassidy? Cassidy: I m going to go into third. Wilson: Well, as far as Cynthia continuing to eat broccoli, I think that was the question Cassidy had, she did try to broccoli smoothie and said she liked it, and I believe when we did it again at the end-of-the-year party, she was going to take it home to her mom. And I think she actually brought her mom and her brother in to try it, too, and they all liked it. I believe they re going to be using it at home, cause they all got the recipe and were real excited. Schlender: and at the same time, Cassidy, I think that Cynthia, who we featured this week on the Eat Your Radio series, also said that she still doesn t like the flavor of broccoli by itself, but she did learn that she likes a lot of other vegetables, and she decided that since she likes a lot of other vegetables, she ll keep eating a lot of those. She likes things like cilantro, and she likes onions, and I believe that she likes tomatoes and bell peppers are examples of some other vegetables she likes. What she learned was that if somebody doesn t like one vegetable, if they really hate it, there s no reason to keep trying to eat that one vegetables. It s sometimes better to go to vegetables that they do like. And I m curious. Do you have any vegetable that you just do not like? Cassidy: Tomatoes. I do not like tomatoes. Schlender: Well, there you go. But you have lots of others that you like that you eat in different ways, and that s a great thing. Thank you for calling you, and I ll tell you what, Cassidy, since you would like to see Heatherwood Elementary have more vegetables, that s a hope of yours, can you call us back and the person who s answering the phone will take your phone number when you re off the air, that way you won t have to give your phone number over the broadcast waves, and then we can get back in touch with you after the show and find out more about how you would like to see more vegetables at your school? Let s see if we can do that. Cassidy: OK.
Schlender: Thank you for calling, Cassidy. Cassidy: Thank you. Schlender: Thank you. Call back. Cassidy: All right. Bye. Schlender: Bye-bye. That was Cassidy calling. You can call us, too, at 303-442-4242 with your questions about vegetables. And Cassidy brought up some interesting points. One is that her whole family likes vegetables. It sounds like it s fun for them. Does that make a difference, if the parents like to eat vegetables and they choose the ones they do like and they share those with their children, is that better than saying, I hate to eat this one, too, but we have to eat this because it s healthy ? Schlender: You know, some of the vegetables that people tend not to like are ones where there may be a genetic reason why they don t like them as much. Science Daily reported in 2006 about the findings ofPaul Breslin of Monell Chemical Senses Center in Philadelphia where he looked at the genetic makeup of people and found that people who have some difficulty making and transporting iodine to their thyroids tended to dislike broccoli more because there s something about broccoli where if you have the wrong genetic makeup, then it s harder to get iodine to your thyroid, and his guess was that that may be one reason why some people don t like that fruciferous [? ], bitter taste. Have you heard of studies like that, too? Wilson: Yeah. And actually, the institute that you referred to, the Monell Institute, has done studies on broccoli and basically bitter-tasting vegetables in general and looked at the link between parents and their children and found that in mothers that had this sensitivity, had the bitter gene, the kids also tended to have the bitter gene, but the mothers could less detect the bitter taste in a solution than the kids, and there s some lessening of that strong bitter flavor with age. And they didn t think the gene went away, but maybe with environment and experience, maybe these moms learned to enjoy broccoli more. So it s very interesting research, I think, to know that there could be a genetic component to it. Schlender: I also wonder how much how current food environment affects our genes as well. Anne Wilson, a question for you. If somebody drinks a lot of sodas, if they have a lot of candy and cookies and lots of sweets, does that affect how their taste buds detect things like the sweetness of broccoli or the sweetness of a tomato or the sweetness of a Granny Smith apple? Schlender: Do you have some concerns about how much sugar is in the diet of most Americans today? Wilson: Well, you know, that s definitely a topic that s really under consideration right now with the epidemic of childhood obesity. But I think for parents out there, it s really good, again, to look at what s available at home. If there is a lot of sweetened beverages at home, if there s a lot of fried potatoes at home, that s probably what kids are gonna eat if that s what s put out in front of them, if that s what accessible to them. But if you re offering a wide variety of fruits and vegetables and there s not a lot of those other items around, that s what you re going to eat. Schlender: All right. A hundred fifty years ago, the amount of sugar that was in the American diet was maybe 20 pounds a year. What is it today? Wilson: I don t have those stats in front of me, but it s definitely increased. Schlender: More like 150 pounds a year? Wilson: I m sure it s increased greatly. Schlender: It s much higher, and some of those sweeteners include high-fructose corn syrup, which there are huge concerns about today. Can you explain some about the high-fructose corn syrup issue? Wilson Well, I think in general, high-fructose corn syrup has been used because it s a great sweetener, it s very inexpensive, even compared to sugar it can be very inexpensive. It is used to sweeten a lot of products today. It may be our palate has changed. Like you said, sugar consumption, if you look at the studies that USDA has done, has gone up greatly in the last 100 years. So there is definitely some concerns with that, especially with the childhood obesity problem that we re facing now. And people are concerned that those added calories from sugar can be contributing to that. So again, with the Superfoods project, our partnership with the Integrated Nutrition Education Program and even with KGNU here, we really want to bring kids back to those wonderful fruits and vegetables that they should be consuming at home and really, if they re involving them in a lot of meals, eating a lot of fruits and vegetables at meals and at snacks, there really won t be a whole lot of room for those other things. So that s really our push. Schlender: That s your goal. With us on the line now is Richard from Lakewood. Good morning, Richard. 0:34:08.3 Richard: Good morning. I couldn t help rejoicing in that call from the little girl who s in third grade. But my experience is that as a person who takes care of other people s kids who don t like vegetables. Schlender: That s pretty common, not to like vegetables. What do you find? Richard: I find it helps to be in a situation where it s just me and the kids, a couple of kids. And like for a lunch situation, and I ve done a number of different things, but one of them is, they come in hungry, and the first thing we ve had was, I steamed some broccoli and just put a little margarine on, a little butter spray, and a little salt, and that s all there was. I didn t even give it to them, I just ate it myself while they were sitting there. Schlender: Oh, my goodness, so you modeled that peer enthusiasm. Richard: And they wanted it, because somebody else was eating it. Schlender: Oh, so you told her it was a special thing that was so good, only grownups could have it? Richard: It was only for adults, yeah. Schlender: Only for adults. That s a great idea. It was only for adults. And finally she said, Now, come on, you ve got to let me try this, too ? Richard: Yup. Schlender: Oh, my goodness. Those are great ideas! Richard: And I like when you put those little tiny broccoli florets into something, it kind of can customize the kids to when it gets a little bigger. So putting it in scrambled eggs, it s just an interesting little color highlight. It looks better than just the scrambled eggs because it has color in it, but you can t taste anything. So get them used to the idea that that s broccoli or that s spinach. Wilson I think that s a great point. I mean, it s nice to be able to incorporate those flavors, even if it s chopped very small into something kids normally consume, , like an omelet or eggs in the morning. We put it into a quesadilla. It was wildly popular. It s just really fun to kind of expose kids to things like broccoli or spinach or whatever on a smaller scale in smaller amounts and really get their taste buds accustomed to it without them being fully aware of a huge piece of broccoli in their omelet. Richard: Yeah. Schlender: Richard, those are super ideas, and if you could do us a favor, if you wouldn t mind signing into the KGNU website for these projects, it s called EatYourRadio.KNGU.org, and leave your comments about some of your ideas and share with us your email address, then we ll be able to get back in touch with you and learn even more about some of the great ideas you ve done, and we can also post those to the Eat Your Radio website. Would you be interested in doing that? Richard: I would. I ll have to go to the library today, because my computer is blasted. But yeah. Schlender: OK. That website is EatYourRadio, with two R s, EatYourRadio.KNGU.org. Richard: OK.
Schlender: We ll look forward to hearing some more of your ideas that way. Thank you so much for calling. Richard: You re welcome. Bye. Schlender: Bye-bye. And it s looks like we have another caller on the line who s called 303-442-4242. This is Oak in Boulder. Oak, welcome to KGNU. Oak: Hi. I m a great KGNU lover. [laughs] My sister-in-law has a wonderful thing that she does with especially organic broccoli, where you get that big stem that people usually cut off and throw away. She uses a potato peeler and peels all the outside part of that stem off until it s down to the white part, and then eats that. It s fairly good. It doesn t have the strong taste the broccoli sometimes has, and it s very good for you. Schlender: That makes sense, too, because that takes away some of the sometimes very fibrous outside part. That sounds like a great idea. Oak: Exactly. And if you really keep scraping that outside part, you ll get down to that white, much softer and much easier to eat part of the broccoli stem, rather than throwing it away. Schlender: Well, that sounds like a wonderful idea. Anne Wilson, do you have some comments on that? Wilson No, but I d love to try it. It sounds really, really good. I hate throwing away the stem myself, so I normally just end up eating the stem whole, but the peeling idea sounds really yummy, too. Schlender: We would certainly agree with you on that. Thank you for your ideas. It sounds like you eat a lot of vegetables. Oak: Absolutely. Schlender: Yeah, that was a great idea, to have somebody enjoy it say, Well, this food may be too good for you, and have the kids say, Are you kidding? I want to try it, too. Oak: [laughs] That s great. Schlender: Thank you again for calling, Oak. Oak: Thank you. Bye-bye. Wilson Definitely. Our ultimate goal is to increase students consumption of fruits and vegetables in our public schools. So any ideas are great, and it s wonderful to hear what has worked for other people. Schlender: And you can call us here at 303-442-4242 with your ideas, your comments, your questions. With us on the phone now is Nancy from Boulder. Nancy, welcome to KGNU. Nancy: Hi, thanks. The first thing I wanted to say was, I just caught occasionally days of the broccoli campaign show, but I thought that was the most creative and wonderful radio program I think I ve ever heard. I just loved it. So thank you for that. And I wanted to just make a comment and then ask a question. The comment is just to underline what you-all have been the way you ve been approaching this issue of how to get kids to eat vegetables, because I ve been so worried, as someone who at a younger age had eating disorders, I ve been so worried about a lot of what I ve seen in the newspapers that seems to emphasize this tone of, you know, Tell your kids it s good for you and you should eat it. Which I think is just a recipe for disaster in terms of eating disorders, and I have had a personal experience of seeing a friend who s quite obese and so wants to save her child from obesity, and it s just creating all sorts of issues around food with this child without realizing it by constantly telling her, It s good for you. You ll stay skinny. All this stuff that just has the opposite effect from what you would want. So it s really great to hear some folks approaching it in a different way. Schlender: And before one thing that I want to mention back to you is, thank you for the feedback. We think that the children who have worked on the Eat Your Radio project are wonderful, and we re seeing how wise children everyone in the fifth grade can be and how their working on stories as journalists through community radio is actually we re getting feedback that that s helping them deepen their understanding of these topics. If you d like to hear more of that, you can go to the website EatYourRadio.KNGU.org and you can hear more of the stories if you d like. Nancy: I plan to go listen to every one, because I love them. Just parenthetically, also, you re probably aware that there s in sort of social movement theory now, there s a great emphasis on not trying to bring knowledge to the people you re trying to help but trying to work together with them and gain knowledge from them about what they need. And so bottom-up rather than top-down change mechanisms have a lot more effect, and I think what you-all did illustrates that. You were effective because you worked with the kids. Wilson Well, I can talk about that on one end. In Colorado, they ve had years and years of vending legislation. It started out as being recommended for vending machines to limit these things, and now new vending contracts are not allowed in schools with regular soda and things like that. You can only have water, 100% juice. Schlender: And Anne Wilson and Nancy, you re bringing up an important point, because for many years, vending machine sales were used in schools to fund school projects, so actually, the soda manufacturers were using their ability to fund schools as a way to push their product on children. This was a common practice 10 years ago, which I think is less common now but still happens in some schools. Is that correct, Anne Wilson, from what you know, that that s one reason that the vending school contracts have been moving more toward water and fruit juices? Wilson Yeah, and in Denver, vending hasn t really even been a big funding source, but I know in some districts across the nation, that has been an issue. Wilson Yeah, that s a good question. And I don t know if I have a great answer for it. But I think it is important to educate parents. It s very difficult, short of a ban, to eliminate these things in our food supply. It s very difficult, when I m at school breakfast and I see a kid come in with a bag of Hot Cheetos and a can of pop, and they got it from home, you can t buy that anywhere in the school. So it is very frustrating to see things like that, and then you watch them throw their breakfast away, they throw their yogurt and their granola away, their fruit. That is difficult to watch. As far as a ban, I don t know what effect that would have. I mean, you know, really, when I ve worked with patients, the best advice is to promote things in moderation, to not eliminate anything, but to really encourage people to limit it as much as possible. Nancy: Yeah, that s interesting. Schlender: And again, thank you for your call. Let s continue the conversation more, and if you want to either leave information about how to contact you at the EatYourRadio.KNGU.org website, or call back and leave your phone number with our kind volunteer who s taking phone calls this morning, either one of those might be a good way to go, because that s a very interesting question. Nancy: Thanks very much for the program. Schlender: Thank you, Nancy. We have just a few minutes left before we are done with our show today, this show about eating vegetables with Denver Superfoods expert Anne Wilson talking about the Eat Your Radio project that we ve been doing here at KGNU. For now, let s go to another call. This will be Gene from Aurora. Welcome to KGNU. Gene: Same to you. Can you hear me? Schlender: We can hear you. Gene: OK. I m going to use your method for talking about eating your radio. In this country, people are eating their TV, because everything is advertised heavily on TV, processed foods, which most of them are unhealthy, most of them contain loads of sweeteners, such as corn syrup, which is cheaper than sugar itself, so that s why they use it. I was surprised when I came 30 years ago in this country that even sausage has corn syrup in it or sugar. And almost everything, almost everything goes from left to right, all around the grocery store, take every product, look at the ingredients, and they have sugar in it. That s one thing. Second, a burger, even a big, fat, juicy burger, is cheaper than a pound of veggies, healthy veggies. So here, people, families, have a harder time educating their children to enjoy and eat their veggies because veggies are not advertised and shoved down the throats of the entire society. Schlender: Well, Gene, thank you very much for those comments, too. We ve just got a minute left, so we re going to ask you also to, if you want us to get back in contact with you, if you can leave a comment at the EatYourRadio.KGNU.org site, that will help us follow through on some of the excellent points that you re bring up, if you might be able to do that. Gene: You should say, Don t eat your TV. Schlender: [laughs] That s a very interesting point. Thank you for that. We re going to go to one more caller before we end, just a quick call now from Lynn, who is from I don t know what city you re from, Lynn, welcome to KGNU. Lynn: Boulder. I just wanted to put in a plug also for high-fructose corn syrup and sugared drinks and soda pop and empty calories of chips are just and the salt content just influences you drinking more soda pop. Those two things, if you just got them out of the entire diet in the U.S., you could probably pay for healthcare reform. Schlender: Interesting point. So you think if we were to do much less to market these really junky, bad-for-you foods, the sodas, the high-sweet, high-fructose foods and the French fries and the salty foods, people would be healthier? Lynn: Yes. Schlender: What do you think about that, Anne Wilson? Wilson: I definitely agree with Lynn that people eat way too much of those things. I was telling you, at breakfast I see kids bringing stuff like that in, and it just really breaks my heart. But again, we really do and I don t know how to approach this except educating families on really not having these items available as much at home and having more fruits and vegetables available at home and more nutritious foods. Schlender: So more nutritious foods. Would you agree with that, too, Lynn, that if people also have fun with the healthier foods, that make the less healthy foods less enticing? Lynn: Oh, yeah. I think the problem is the parents, too, because it s generational. They ve been used to that, and then they eat it, or they re in a hurry because of their job, they buy instant food for the freezer instead of making and getting into food themselves and making it part of their lives. Schlender: Yes, that s a good point. We d love to talk with you more. We ll encourage you, too, to go to EatYourRadio.KGNU.org, because we just have 30 seconds left before the Morning Sound Alternative starts bringing beautiful music your way. We want to use this time to thank you, Anne Wilson, for joining us here at KGNU. People who want to leave a comment for Anne, if you ll leave a comment at the EatYourRadio.KGNU.org site about how you would like to get in contact and why that would be wonderful. Anne, thank you for taking the time to come here. You ll be in more schools this next year to talk about Superfoods? Wilson: Yes, I m sure you ll be hearing more. Thank you very much. Broccolli and mustard? Hm. I like BOTH but together? Hm. HMMMM.LOL. Great work kids – and great work by Dr. Carrot!